The United Nations has called on the Government to go back to the drawing board over its £1.4bn Stonehenge tunnel plans. United Nations agency UNESCO, urged ministers to reconsider their 2.9km tunnel plan and 2.2km dual carridgeway options for Stoneghenge over concerns that the Outstanding Universal Value (OUV) of the World Heritage Site (WHS) would be damaged. UNESCO has recommended a non-tunnel bypass option to the south of the property - known as route corridor F - and longer tunnel options to remove dual carriageway cuttings from the property. It suggests this will reduce potential impact on the WHS. Highways England had assessed UNESCO’s proposals and stated that, ‘a bypass outside the World Heritage site would have a number of significant disadvantages, particularly adverse environmental impacts and impacts on local communities'. Highways England's plans include the 2.9km tunnel under the WHS, a bypass for Winterbourne Stoke and improve the existing junctions between the A303 and the intersecting A345 and A360. The Government-owned company has said the aim of the scheme is to transform the route into an expressway, 'a new type of strategic road which is as safe and reliable as a motorway and where ‘mile-a-minute’ journeys are the norm’. 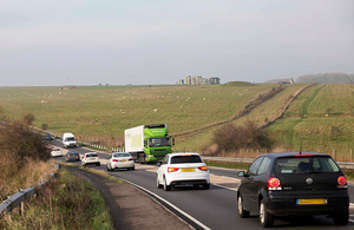 Kate Fielden of the Stonehenge Alliance said, ‘It is very heartening that our concerns about the A303 widening project that we have voiced over many years are now being addressed by UNESCO.